Christmas time, mistletoe and wine, and adults to play slot online We all love Christmas, so therefore here is a splendidly festive themed 5 reel to tide you into the New Year and beyond. Take an adventure with Santa Claus to the Winter Wonderland and uncover as many prizes and free spins as you can manage. Ho! Ho! Ho! Leading online slot developers Net Ent recently released this festive fun slot game back in December last year. It was in 2015, that two Christmas themed games were launched by the Swedish software developer. 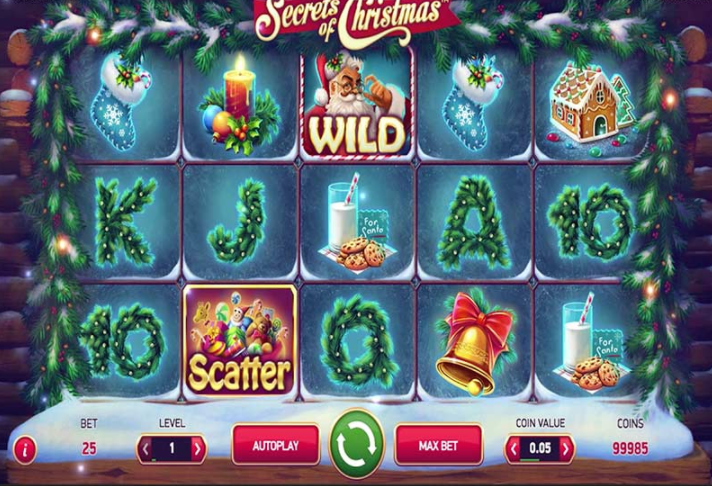 Following a long stint without a successful and adored Christmas themed slot game, NetEnt developed Secrets of Christmas and soon re-established themselves as innovators of an increasingly saturated genre. You can learn more on slots games features from NetEnt's creations. Secrets of Christmas is set on 5 reels, 3 rows and has 25 fixed pay lines. The game symbols are as festively cute as it can possibly get, so expect a lot of Christmas garlands and decoration, milk and cookies, candles, gingerbread houses, gift stockings as well as card symbols 10, J, Q, K, and A all woven with Christmas tree branches and fairy lights. Enjoy the best spin slots with gifts and bonuses here. The highest paying symbols in the Secrets of Christmas slot is the bell, if the player lands 5 of them on the pay line they will receive a scrumptious win. The Wild symbol here is the Santa Claus himself who substitutes all the other symbols apart from the scatter. This festive classic is a great game for gamers new and old, the amateurs and the experienced, and anyone who’s looking to find their feet in the online slot world. Enjoy the diverse betting structures that are available in this game and place bets on lines for as little as 25 pence. 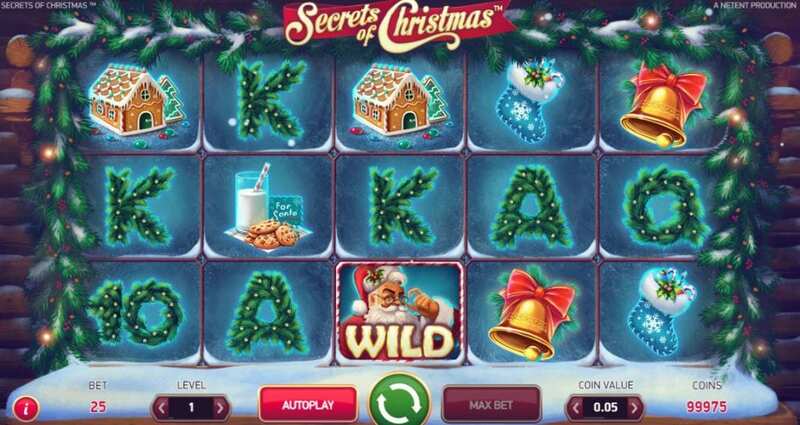 This truly is a Christmas themed online slot game that everyone can get involved with. 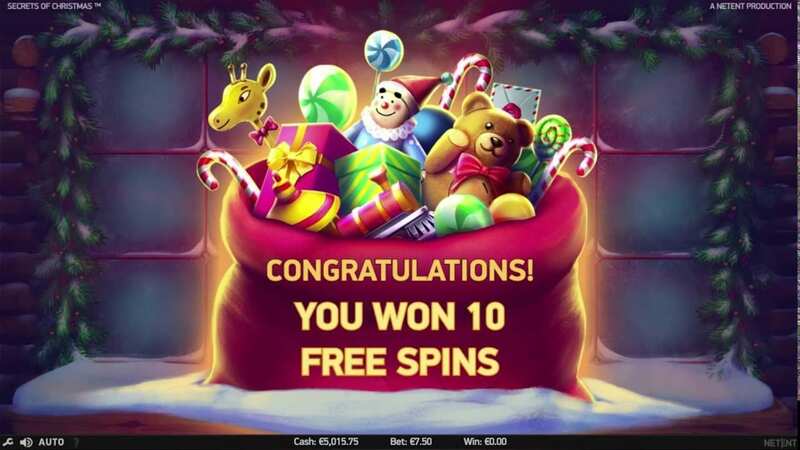 Upon landing on three or more Scatter symbols to launch the Secrets of Christmas free spin feature the player can pack 10 free spins into their stocking, but first, you must choose some Christmas gifts to win free spin bonus features. Such features included are extra wild symbols, wild reels, multipliers, additional free spins and then move into the fireplace to the cozy and warm free spin zone. Additional bonus features play for the duration of the bonus game and the Carols break loose at the same time. When the player scores big, this game will let you know about it, with celebratory festive music and decorations.